Note: Technically, these towns are not in "Normandy". But they were heavily involved in the war. As Luke and I drove by several French towns on our road trip, we saw massive cathedrals towering over the other buildings. After we finished our World War II explorations on Saturday, we decided to use Sunday to visit some of these cathedrals. To find the location of each cathedral, I would simply zoom in to the town, enter "cathedral" and go with whatever google-maps-lady declared was the town's cathedral. It seemed to work all right! The journey began on Saturday though as we did not want to back track. On the way home from La Fiere, we decided to stop in Bayeux. Officially name Cathédrale Notre-Dame de Bayeux, Bayeux Cathedral was difficult to photograph as a whole as it was nestled in a small square of the town. As we were quite exhausted from our long day, we only just snapped a few pictures and then hit the road again. On Sunday, we first stopped in Rouen to see Cathédrale Notre-Dame de Rouen, or Rouen Cathedral. The main spire was huge (almost 500ft tall), but we were still pretty close to fitting the whole building into one frame. The exterior decor was amazing, specifically the front (the first picture is a side view). Inside the church were damaged sculptured that used to be on the exterior. We, of course, liked Saint Andre the best! On our way out of Rouen, we saw some of Rouen's unique architecture which has me wanting to go back for more!! I hopped out to take a few pictures while Luke made the block. And again, as we were on our out of town, we had to stop again when we passed by another church, Church of St. Ouen. We put an end to it there though as we would have stayed for hours looking at all of Rouen's churches. Next, we stopped in Amiens. 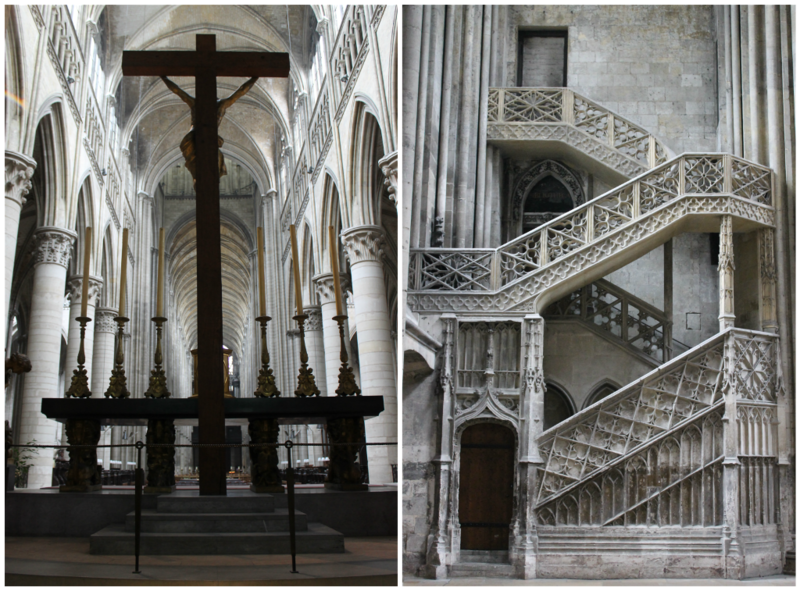 The Amiens Cathedral (Basilique Cathédrale Notre-Dame d'Amiens) was very easy to photograph! It seemed the cathedrals were getting better and better as we stopped. This one was actually listed as a UNESCO World Heritage Site in 1981. It is the largest cathedral in France (based on its internal dimensions). We could have stopped in more town on our drive, but we had a ferry time to catch. We departed France with some glorious sunshine though! Over all, our road trip was a great success, and I am so glad we took the time visit as many World War II sites as possible in Normandy. It was an indescribable feeling to be standing in the exact spot where a huge historical event took a huge turn. This is one trip I will never forget! I can't wrap this up without giving a major huge thanks to my husband for doing ALL of the driving for the weekend. If I was licensed to drive in the UK, I would have pitched in, but he took one for the team! Thank you! Thank you! Thank you! Rouen is located on The Seine, the same river that runs through Paris.